Photo Credit: Anthony Albright. Used with permission under Creative Commons license, Flickr, altered. Recently, as I was waiting in a hospital lobby, an article in their newsletter caught my eye. It said that they are now serving antibiotic-free meats in their cafeteria. I was elated! Why? Because by serving antibiotic-free meats, the hospital may very well reduce the likelihood of its patients developing a resistance to antibiotics. Simply put, it means that if you have tuberculosis or get food poisoning, and are therefore hospitalized, the antibiotic prescribed by your doctor may be more likely to fight off the infection. Antibiotics are powerful tools for fighting infections and diseases in humans. 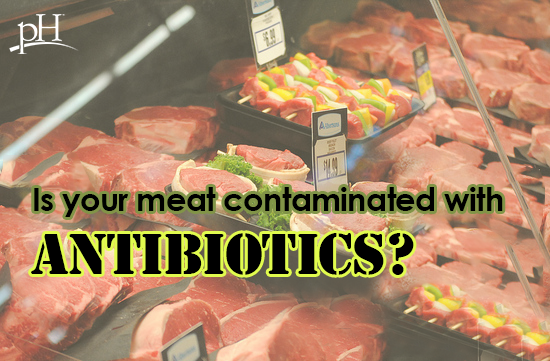 How are antibiotics used in meats? Over 70% of antibiotics in the United States are used by the meat industry in non-therapeutic applications in food animals to stimulate growth. Overuse of antibiotics in food animals has helped create new strains of bacteria in these animals, and these bacteria are outliving the very drugs used to treat them. Resistant bacteria that develop in food animals can be transferred to the general human population via food. If a person ingests the resistant bacteria via improperly handled or improperly cooked meat and becomes ill, he or she may not respond to antibiotic treatment and die. More than 60,000 Americans die from resistant infections annually. Scientists around the world have provided strong evidence that antibiotic use in food animals can lead to resistant infections in humans. Concern about the growing levels of drug-resistant bacteria has led to the banning of sub-therapeutic use of antibiotics in meat animals in Canada and Europe. In the United States, however, such use is still legal. So what better forum to demonstrate healthy eating habits than in hospitals – the place where sick people generally go to be cured of their illness. I applaud all hospitals that have chosen to be proactive and buy organic meats, and I encourage more hospitals to follow suit. Whether you’re at a hospital, restaurant or cooking at home, always choose organic meats whenever possible to reduce your chances of developing antibiotic resistance. This is just one small step that can make a big difference in helping you get to your optimal health. Learn more about how pH Labs can help you achieve optimal health here.